Blog Updated At 2:16 PM MST Sunday. Northeast Of Whites City, New Mexico. 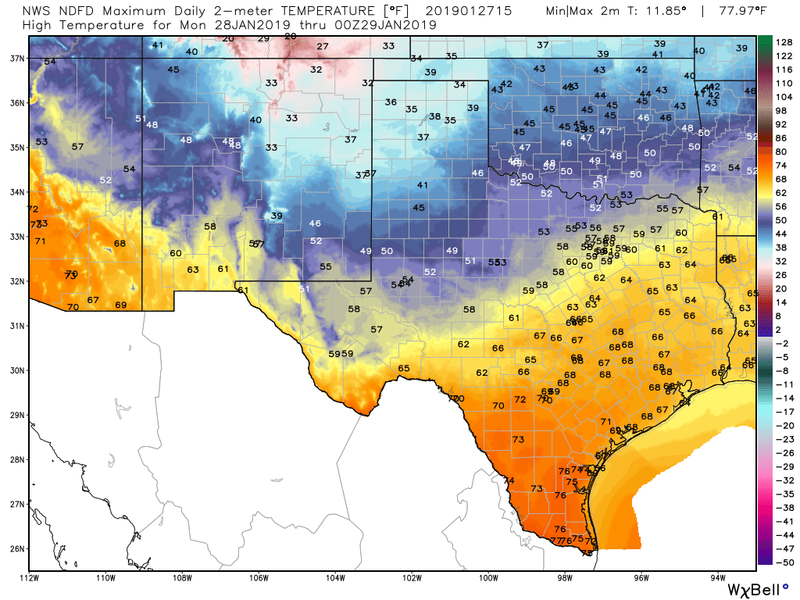 Blowing dust kicked up by northerly wind gusts of around 40 mph formed along the leading edge of a fast southward moving cold front Friday, January 19th. 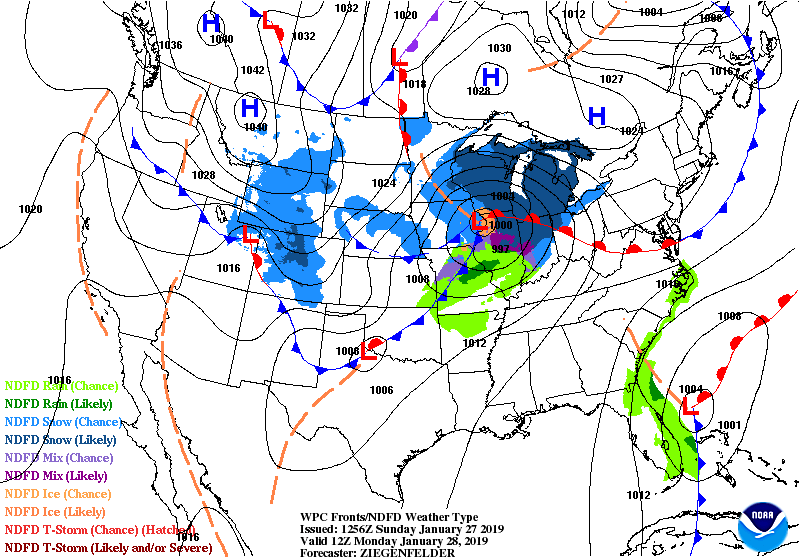 Until we get a soaking rain or a good wet snow this trend is likely to continue into Spring. Brutally Cold In Canada This Morning. 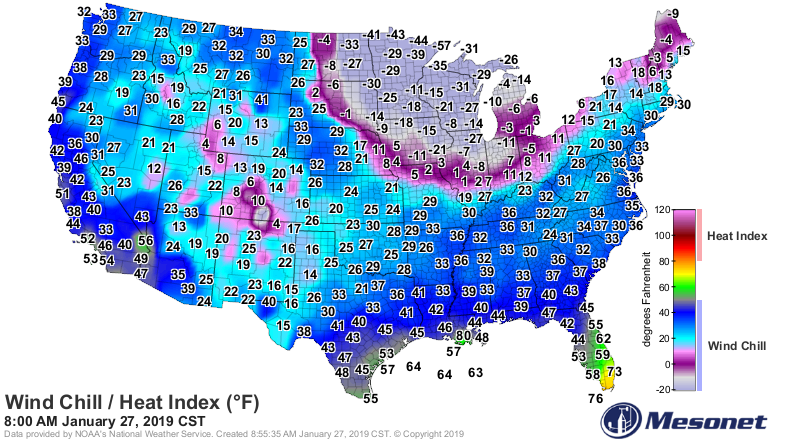 Temperatures At 7 AM MST. 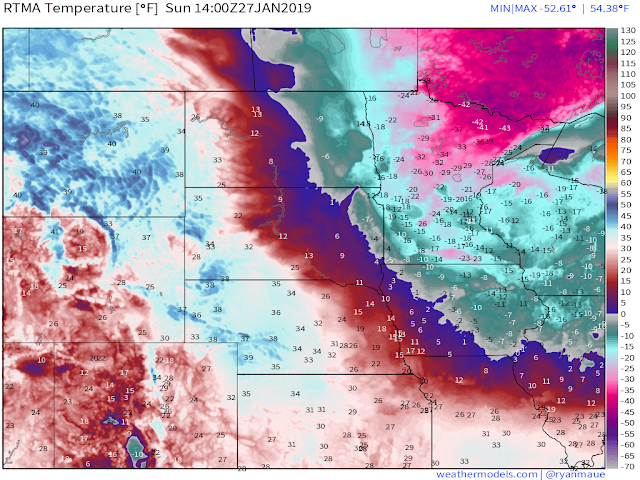 RTMA Temperatures At 7 AM MST. 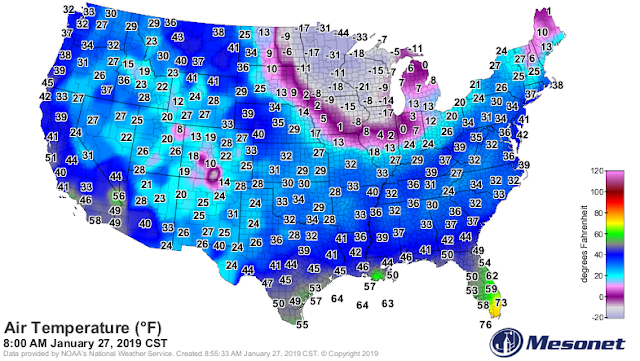 RTMA Wind Chill Temperatures At 7 AM MST. 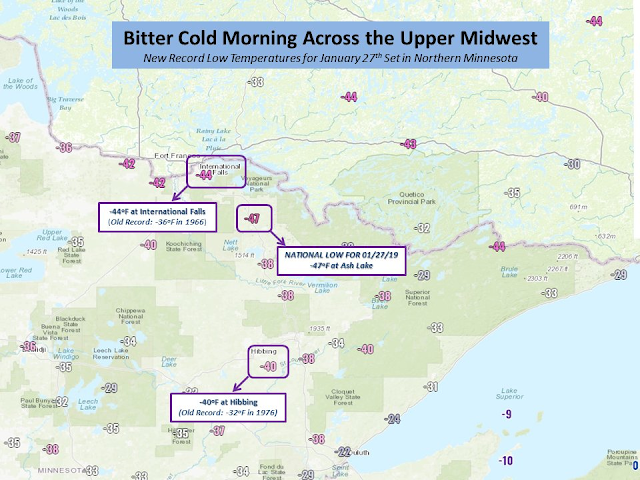 Record Lows Reported This Morning. 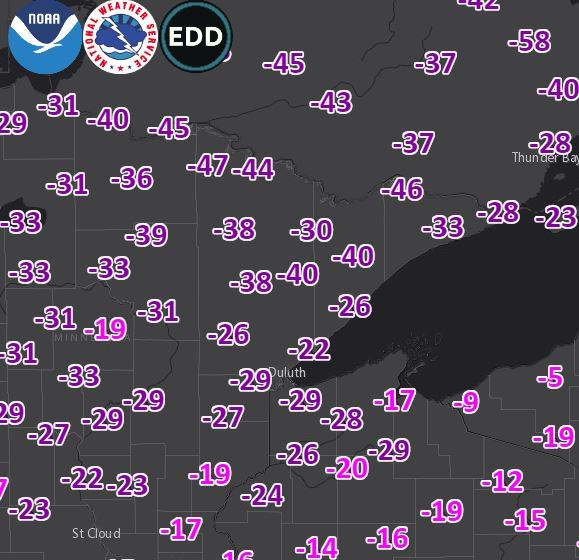 NWS Duluth Minnesota Low Temperatures This Morning. Brutally cold arctic air has settled in across Ontario, Canada. 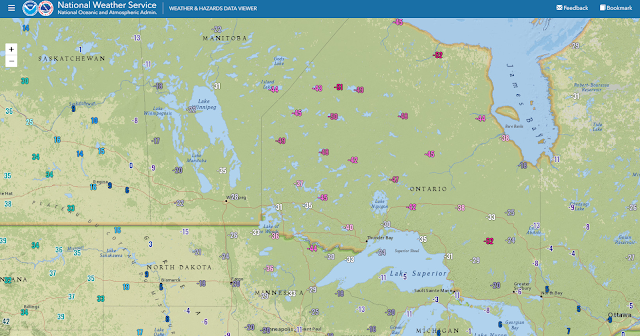 Reported lows as of 7 AM MST this morning include -52ºF at Auden Near Foleyet, -52ºF at Peawanuck, and -51ºF at Bearskin Lake. Wind chill temperatures have dipped down as low as -63ºF. Interesting enough on the western (warmer) side of the arctic cold front slicing through the Canadian provinces Lethbridge in southern Alberta southwest of Medicine Hat, and just north of the U.S./Canadian border reported a high temperature so far of 50ºF since midnight MST. That's an astounding temperature difference across the arctic cold frontal boundary of 102ºF. 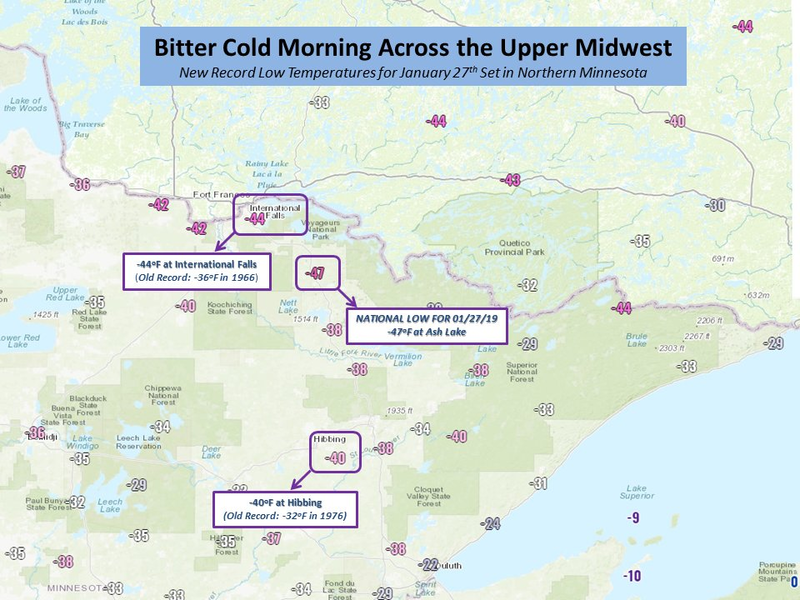 Local Reported Low Temperatures This Morning. 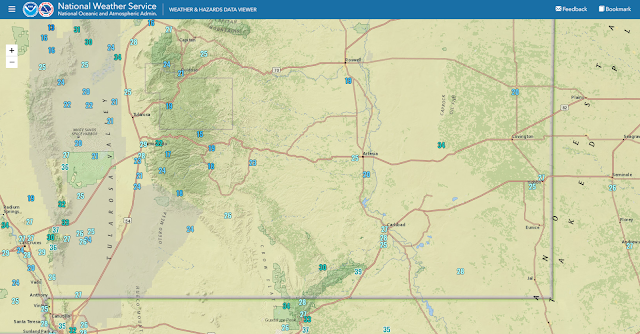 Here in Southeastern New Mexico our lows this morning have ranged from 15ºF reported by a Personal Weather Station (PWS) in 16 Springs Canyon (7,367') northwest of Mayhill, to 37ºF at Guadalupe Pass (5,449'), and 39ºF at the Bat Draw Raws (4,425') at the Carlsbad Caverns National Park Visitor Center. 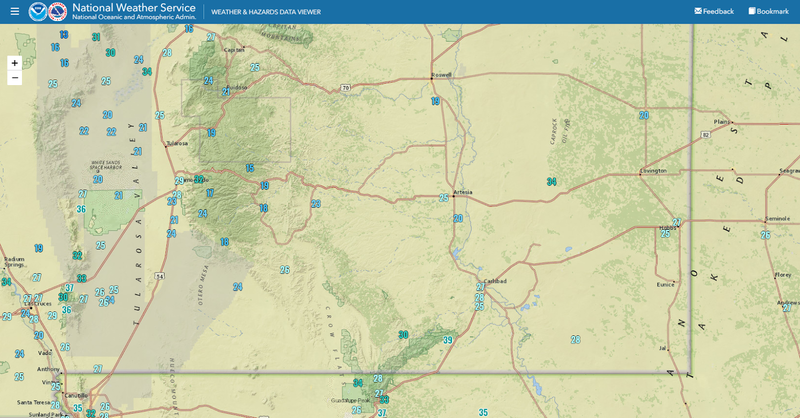 The Roswell Airport (3,622') dipped to 19ºF, and the NMSU AGSC automated weather station 6 miles south of Artesia (3,369') reported 20ºF. Record Cold For The Midwest Mid-Week. 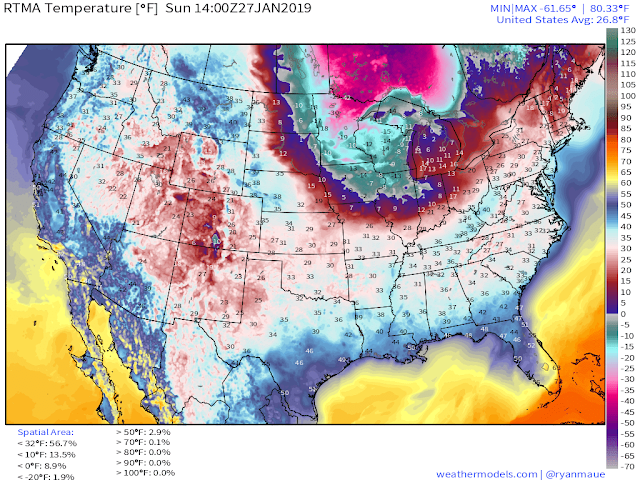 U.S. GFS Forecast High Temperatures Wednesday. 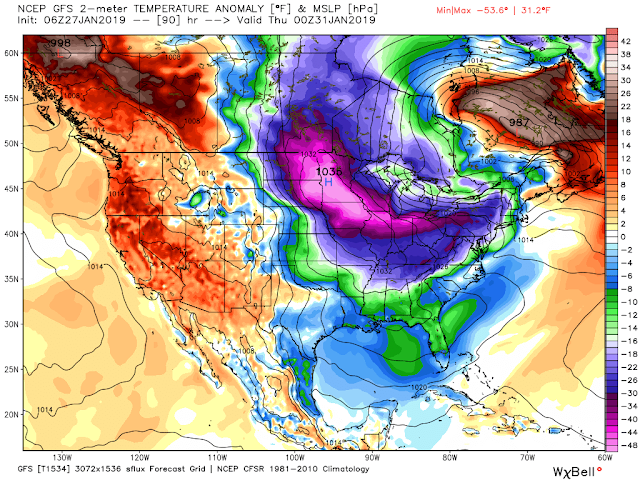 U.S. GFS Forecast High Temperature Anomalies Wednesday. 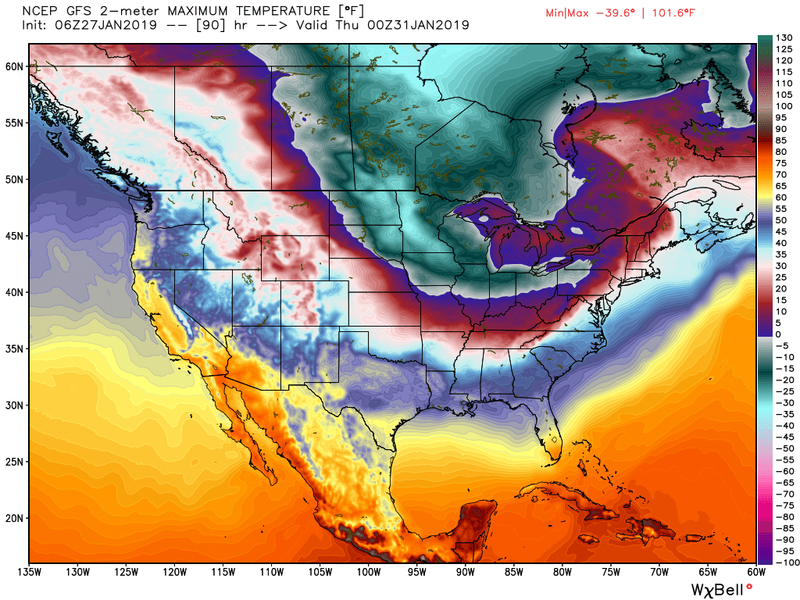 Those areas that are shaded in purple are forecast by this one model run will have high temperatures that will be some 30ºF to 55ºF below normal Wednesday. 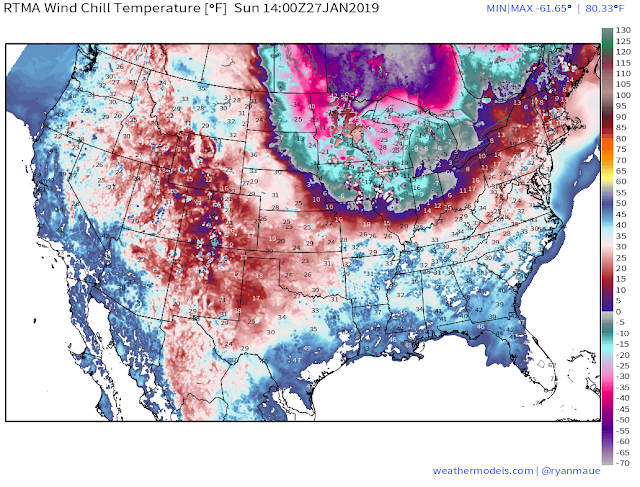 With many locations only seeing highs of -10ºF to -30ºF. 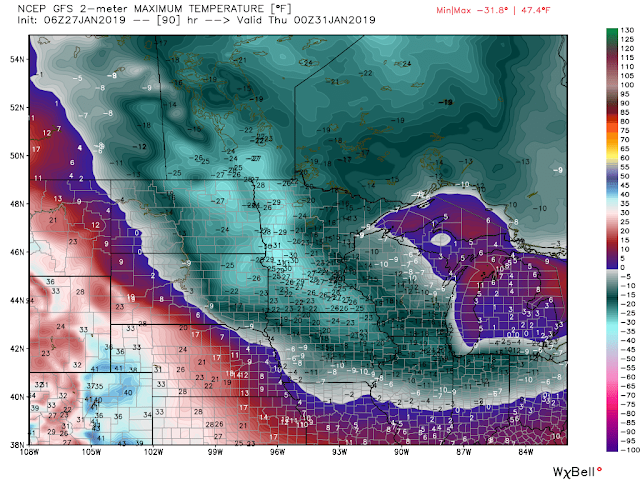 Temperatures in some of these areas are forecast to remain below zero for several days in a row. 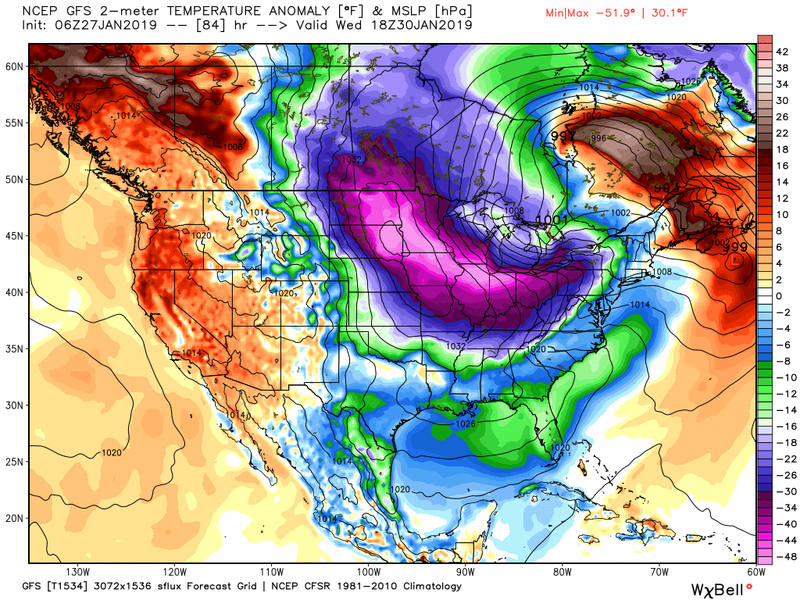 This arctic outbreak is expected to bring the coldest temperatures seen in these areas since 1994 and 1985. Many locations will likely establish new daily record low high and record low temperatures during this outbreak. These temperatures and wind chills won't just be an inconvenience, they will have the potential to be life threatening to anyone not properly protected when outdoors. 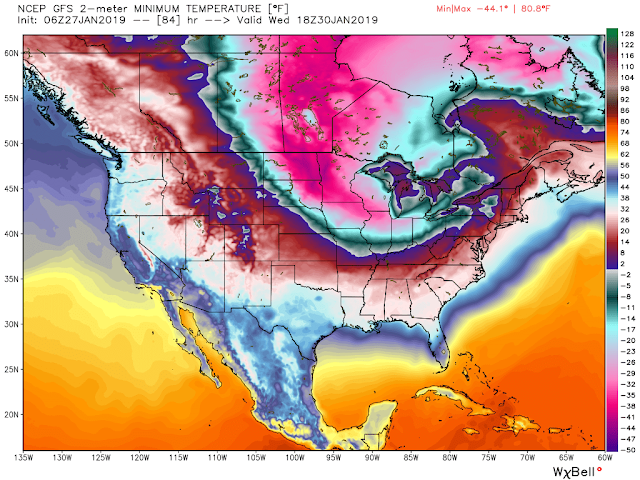 U.S. GFS Forecast Low Temperatures Thursday Morning. 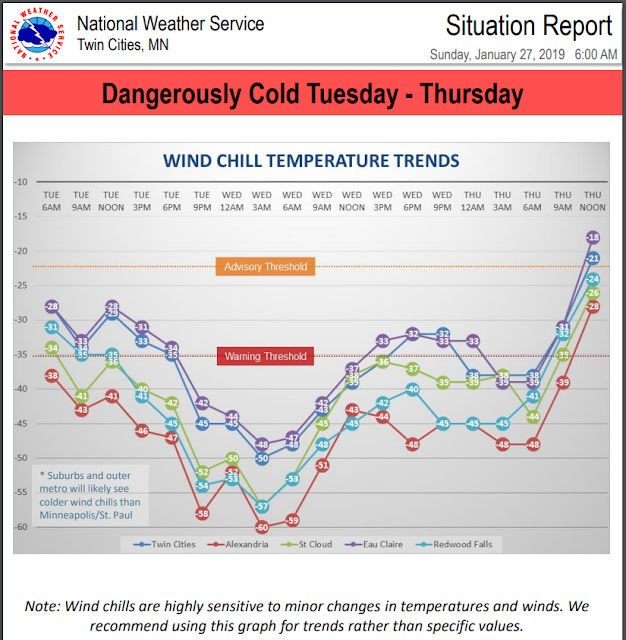 Low temperatures are forecast to range from -10ºF to close to -45ºF Thursday morning. 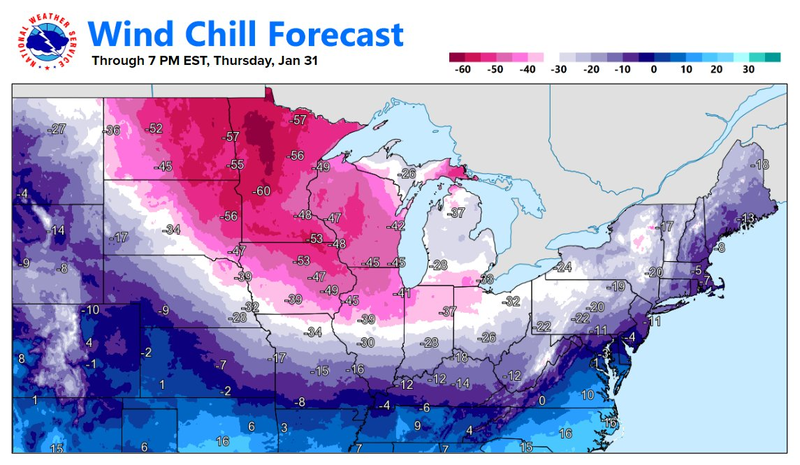 Forecast Wind Chill Temperatures This Week. 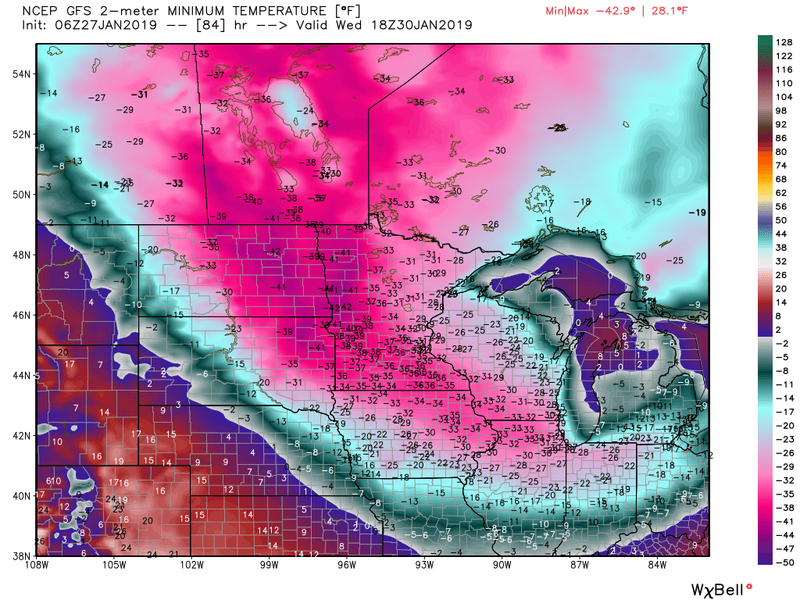 Wind chills will fall to dangerous levels in the Upper Midwest this week, and should be the coldest since the mid-1990s in parts of the eastern Dakotas, Minnesota, Iowa, Wisconsin and northern Illinois. Wind chills falling below -40 can cause frostbite on exposed skin in minutes. 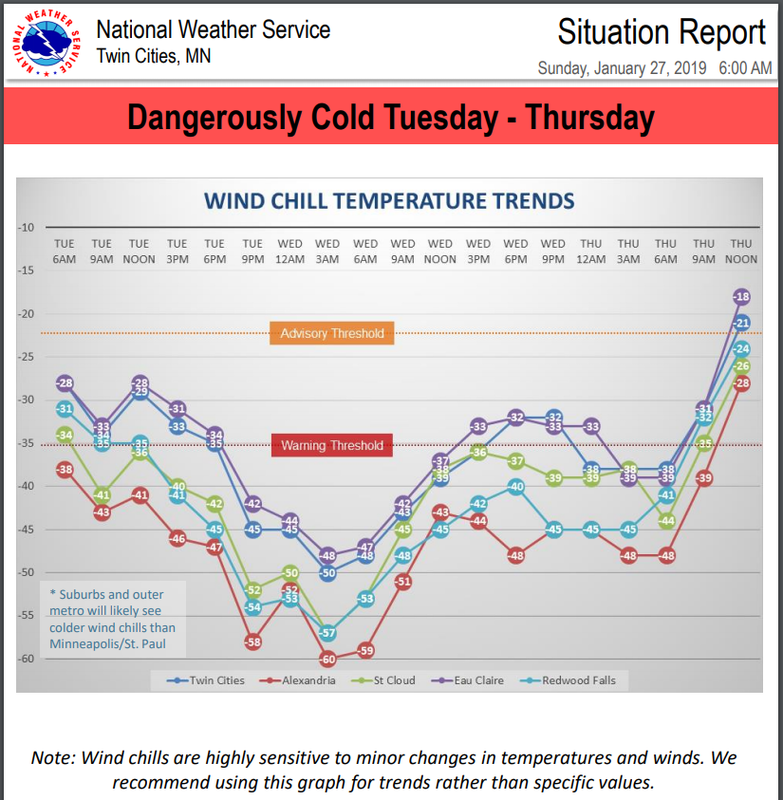 NWS Twin Cities (Minneapolis /Saint Paul, MN) Wind Chill Forecast. 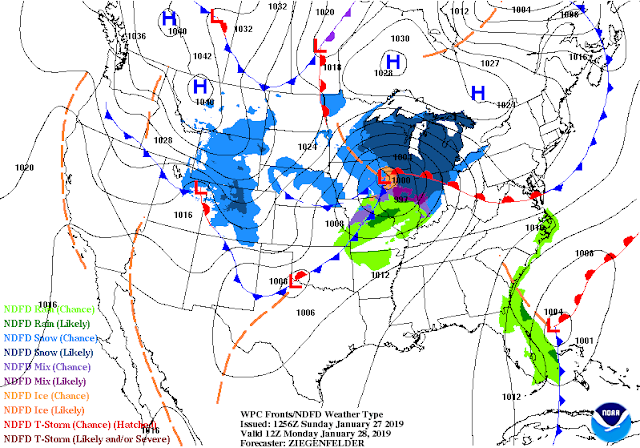 Strong Cold Front Early Monday Morning. 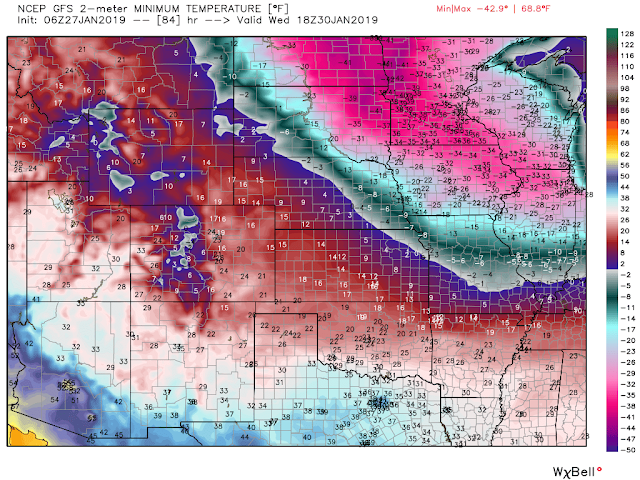 Valid At 5 AM MST Monday Morning. 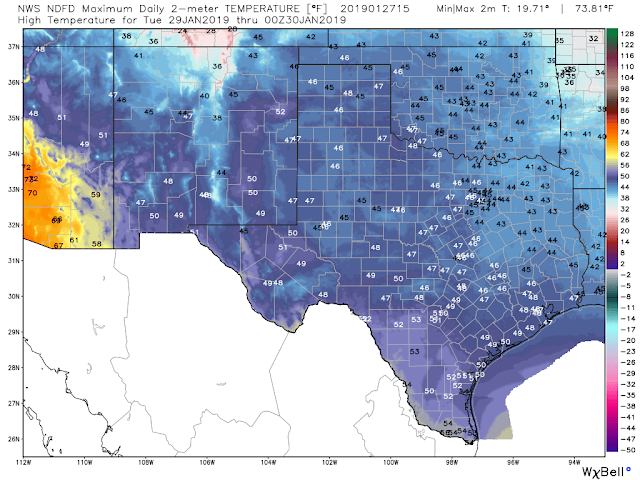 Southeastern New Mexico and parts of West Texas will get a glancing blow from a southward moving arctic cold front Monday morning. Strong gusty northerly winds will likely kick up local areas of blowing dust as the cold front plows southward. 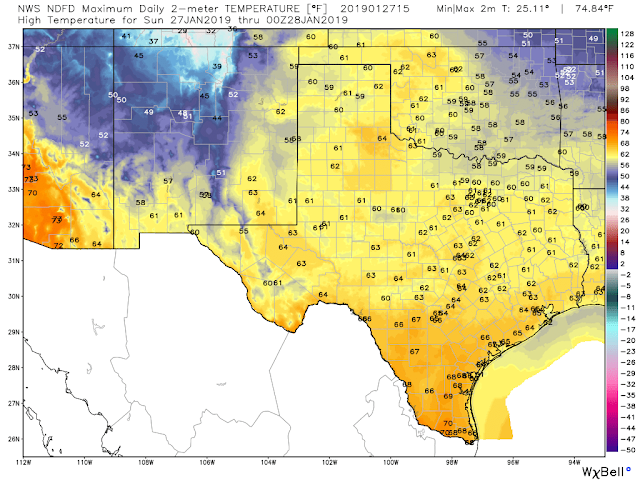 Falling temperatures will accompany the frontal passage through the morning with our warmest temps in some locations occurring at or around midnight. Monday's high temperatures will occur early in the morning and depending upon the speed of the southward moving cold front, some of us may not get as warm as currently forecast. Tuesday will be cool with widespread highs in the 40's but this is nothing remarkable this time of the year.